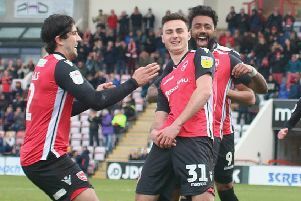 David Amoo scored the only goal of the game as Morecambe slipped to a Boxing Day defeat at the hands of struggling Carlisle. The former Liverpool youngster was on the end of a swift counter attack on 51 minutes with his shot going under Shrimps ‘keeper Scott Davies and in. It was a frustrating afternoon for the hosts who saw their tendency to struggle against League 2’s lower ranked sides continue. In front of a record Globe Arena crowd for a Football League game both sides made enterprising starts without testing the respective goalkeepers, Kevin Ellison firing high and wide for the hosts as captain Danny Grainger did likewise for the Cumbrians. Antony Sweeney headed a half chance over the bar on the quarter hour as the game settled with both side’s endeavours rarely translating into promising situations in the final third. As both sides cancelled each other out Carlisle’s best opening came from a moment of fortune 10 minutes before the break. The ball cannoned around the edge of the area before running for Kyle Dempsey with Andy Parrish in the right place at the right time to produce a fine challenge. Dempsey then saw a 25-yard shot whistle wide 60 seconds later as the momentum shifted in favour of the visitors. The Shrimps came close to going in front themselves before the interval however, Ellison seeing a header from a Shaun Beeley cross go agonisingly across the face of goal before Jamie Devitt’s cross nearly found the veteran in one-on-one as Jim Bentley’s side counter attacked with menace. The hosts were first to go close after the break, Devitt’s 30-yard drive being helped over by Dan Hanford five minutes into the second half. Keith Curle’s side were ahead a minute later however. A swift counter attack ended with Amoo cutting in on the right edge of the area past Mark Hughes with his low left-footed effort going through Davies and in. The game had needed a goal and sure enough it came to life, Ryan Edwards and Stewart Drummond both seeing headers go wide for the hosts. As expected things became increasingly stretched with both sides having openings, Ellison firing a volley into the stands from 15 yards before Courtney Meppen-Walter drilled a shot narrowly over at the other end. Substitute Jack Redshaw then drilled a low shot inches wide 20 minutes from time as the Shrimps went in search of an equaliser. Morecambe ramped up the pressure but huffed and puffed without reward as despite their territorial advantage, Hanford was rarely troubled in the closing stages. The closest they came was Padraig Amond’s effort on the turn in stoppage time, Hanford tipping the left-footed shot round the post. Morecambe: Davies, Parrish, Hughes (capt), Edwards (Redshaw 65), Beeley, Drummond, Kenyon (McCready 80), Wilson, Devitt (Williams 80), Amond, Ellison. Subs not used: Arestidou, Goodall, McGowan. Carlisle: Hanford, Brown, Archibald-Henville, Anderson, Grainger (capt), Meppen-Walter, Sweeney, Potts (Asamoah 76), Amoo (Symington 81), Dempsey, Beck (Thirwell 90). Subs not used: Eccles, Brough, O’Hanlon, Hammell.